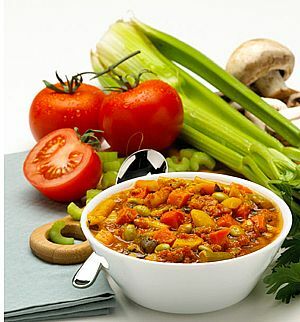 Is The New Cabbage Soup Diet healty? Cottage cheese(50 g/ 2 oz), 2 tablespoons of sour cream (22g/ 0.8 oz), 1 slice of white bread (22g/ 0.8 oz), a cup of tea with 1 teaspoon of sugar(4 g/ 0.15 oz). 10 a.m.
Cabbage soup (280 ml/ 10 fl.oz), 1 slice of white bread (22g/ 0.8 oz), carrot sweet salad. 2 p.m.
Cabbage soup (280 ml/ 10 fl.oz), 1 slice of white bread (22g/ 0.8 oz), classical vegetable salad, a cup of tea with out sugar. 6 p.m.
1 glass of unsweetened vegetable juice (170ml/ 6 fl.oz). Cut up the the broccoli and cauliflower. 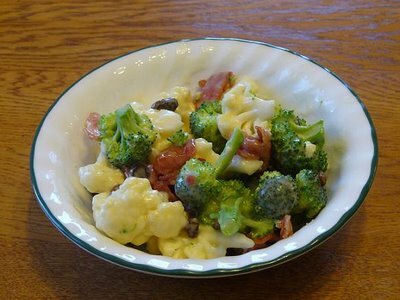 Place into mixing bowl: broccoli, cauliflower, onions and dressing. Toss, cover and refrigerate.Add sunflower seedbefore serving. 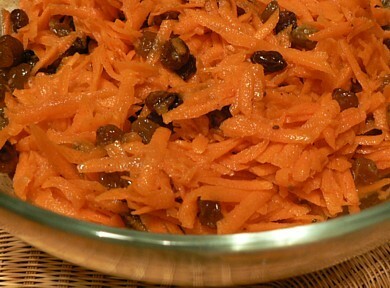 In a bowl, combine the carrot, apple, raisin and sour cream. 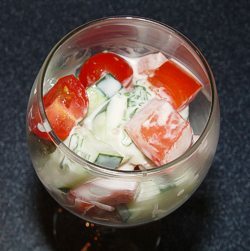 In a bowl, combine the cucumber, tomato, onion, sour cream and mayonesa. Salt to taste.